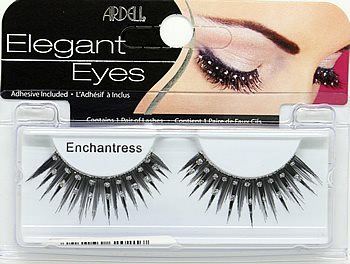 Ardell Elegant Eyes Enchanting faux lashes / also known as Ardell Elegant Eyes Enchantress Lashes (62021) are long, feathery lashes, with a hint of glitter. Natural in appearance, yet simultaneously eye-catching. Comparable to Ardell Wild FUN lashes. 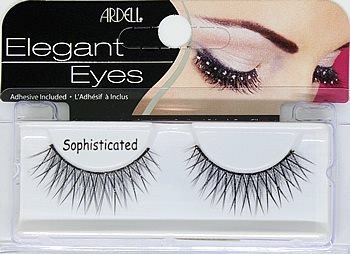 Packaging: Please note Ardell is changing the name of this style from Ardell Elegant Eyes Enchanting to Ardell Elegant Eyes Enchantress Lashes. The lashes are similar, but not exactly the same. Please note Ardell Elegant Eyes Enchanting Lashes is currently out-of-stock; Item will be available shortly. Ardell Elegant Eyes Enchantress Lashes are long, feathery lashes, with a hint of glitter. Natural in appearance, yet simultaneously eye-catching. Ardell Elegant Eyes Glamorous Lashes have a sophisticated criss-cross pattern with a glitter sparkle lash band. 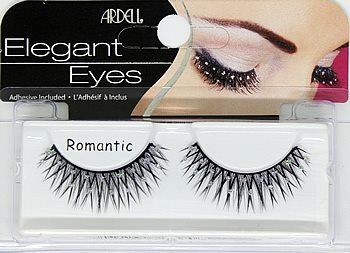 Ardell Elegant Eyes Romantic Lashes have a unique criss-cross design, with specks of glitter cleverly placed on the lash strands. Sparkle! Ardell Elegant Eyes Stunning Lashes are full and voluminous, accented with several light-catching crystal rhinestones. More Styles for a Night Out? Looking for a more glamorous false eyelash style for that special night out on the town? Try Ardell's Wild Lashes. This new collection of "wild" lashes take eye accessorizing to a whole new level. The collection includes an assortment of extreme lashes featuring rhinestone and glitter designs.